Georgios D. Karatasios, former Regional Director of Primary and Secondary Education of Central Macedonia, is a graduate of the Physics and Mathematics Faculty,Aristotle University of Thessaloniki, a PhD holder of the Polytechnic School of the Aristotle University of Thessaloniki, and also holds a postgraduate degree of the Interdisciplinary Program “Inclusive Education: a school for all”. 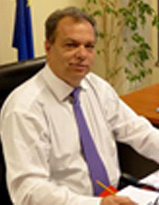 He is currently a lecturer at the Department of Public Administration of Neapolis University Pafos, and has also been a lecturer at the Department of Educational and Social Policy of the University of Macedonia, at the Polytechnic School of the Aristotle University of Thessaloniki, at the University of Western Macedonia and at the Technological Educational Institution of Thessaloniki. He is one of the scientific and training staff of the National Center for Public Administration and Local Government and of the Inter-Balkan Institute of Public Administration.